As the U.S. considers a response to what it calls a chemical weapon attack by Syria’s Bashar al-Assad regime that killed hundreds of civilians, reliable Middle Eastern sources say they have evidence the culprits actually were the rebel forces trying to take over the government. Reports that the Obama administration is considering a military strike against the Assad government continued to circulate Monday. Meanwhile, U.N. weapon inspectors in Syria were fired upon by snipers as they attempted to investigate the site of the Aug. 21 attack. Assad has rejected charges that his government forces used chemical weapons as “preposterous” and “completely politicized,” the Los Angeles Times reported. He argues Syrian forces were in the targeted area. “How is it possible that any country would use chemical weapons, or any weapons of mass destruction, in an area where its own forces are located?” Assad asked in the interview with Izvestia, according to a translation provided by Syria’s official news agency and published by the Los Angeles Times. 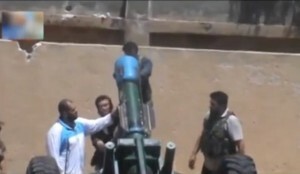 As seen below, a screen capture from the video shows rebel civilian forces placing a suspicious blue canister on top of a rocket-launching device. 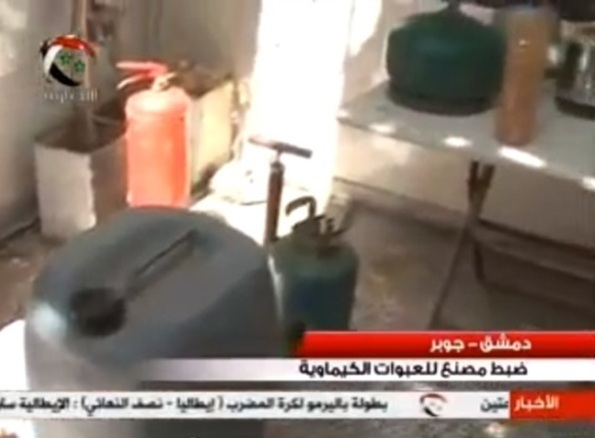 A separate YouTube video from Syrian television shows a government-captured arsenal of what appears to be nerve gas weapons seized from a rebel stronghold in Jobar, Syria. The image below shows canisters in the seized rebel arsenal from Jobar that appear to resemble the canister launched by rebel forces in the first image above. 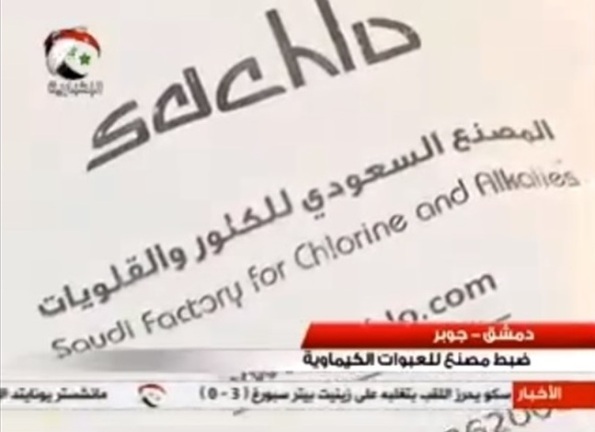 A report from the Russian Arabic-language channel RT Arabic shows captured rebel arsenals apparently with chemical agents manufactured in Saudi Arabia and gas masks, supporting Russian claims that the rebels are the culprits in the alleged chemical attack.